Sometimes installing an ad-blocker on your browser may not be enough to stop all these annoying ads from coming. Perhaps you are seeing them not because of the websites you visit, but because you have something like BrowsePlus installed on your browser? If you are using the Google Chrome browser, and you cannot surf the web properly because of all the commercial offers, there is a good chance that you have this adware application running. You can remove BrowsePlus manually via your browser’s settings, but do not forget to run a full system scan with a legitimate antispyware tool as you may have more unwanted guests on-board. We believe that some users could get BrowsePlus accidentally when they come across the getishopping.com website. This page promotes and distributes this add-on, although if you click the Chrome icon on the site, you get redirected to the Chrome store. Nevertheless, the site informs us that this “browser add-on helps you shop better,” and when you “view a product online, Browse Plus lets you know where you can find it for a lower price.” That would not be much of a problem if the application could really deliver, but we are bound to believe that sometimes it displays unreliable content. What’s more, BrowsePlus may enter your computer when you expect it the least. Even if an adware program has an official distribution source, it is far more likely that it arrives at the final destination in a band wagon. Meaning, you install the unwanted program bundled with other freeware applications. This is possible because users often indulge in freeware downloads as there are countless freeware websites that offer a variety of software applications for free. However, please remember that those freeware applications often support commercial ads because they need to cover their development costs somehow. Not to mention that third-party installers that distribute them often contain several other applications like BrowsePlus. Thus, if you go through the installation automatically, you will end up with a bunch of unnecessary programs on your PC. If you are an avid shopper, you may think at first that BrowsePlus is a useful program that can really help you save money when you shop online. Unfortunately, that is not really the case. Although it is true that the application will display commercial offers, only few of them may be completely reliable. You have to understand that such applications do not review the ad content, and they do not really care whether you will be exposed to potential threats, as long as you click the ads and help their developers make money. Therefore, you have to take your internet safety into your own hands and remove BrowsePlus at once. You may have many other unwanted programs on your computer as well, so to determine which applications have to be removed from your PC, please scan your system with the SpyHunter free scanner. Do not hesitate to invest in a computer security tool if need be. As for the BrowsePlus removal, you can follow the instructions below to get rid of this add-on. The most important thing to remember is that you need to nip all the potential cyber security problems in the bud. 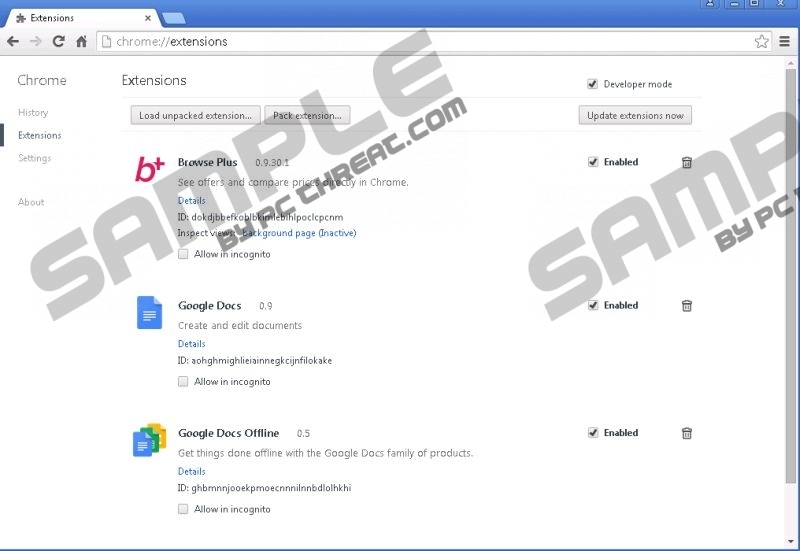 Click Extensions on the drop-down menu. Remove Browse Plus from the list and restart your browser. Quick & tested solution for BrowsePlus removal.